A chance to perform a 15 to 20 minute set on the hardDrive tour on Sun, Oct 18, 2009 at The Regency Ballroom at 8:00 pm. The winning artist will also receive national recognition on hardDrive and hardDrive XL, tour t-shirts, and will meet the other bands on the bill. Visit here for more details. 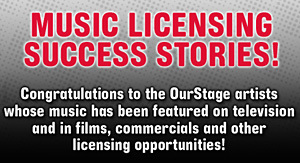 Accepted genres must fall into the following genre based categories on OurStage: Hard Rock Channels including Hard Rock, Metal, Grunge, Modern Rock, Alternative Rock and Nu Metal. Any musical genre that is outside the genres above will be removed from the competition. The Entry must be an acceptable Radio Version with clean lyrics. Artists can only submit one song into the competition and must be twenty-one (21) years of age or older at the time of entry. One artist or band member must legal resident of the Bay Area Designated Market Area as defined by Nielson Media Research by as of September 1, 2009. For more info visit the OurStage FAQs .